Dina Kowal Creative: Forget Me Not! Here's a little teaser for our 'Week of Sneak Peeks' hop coming up in a few days - you're going to love Impression Obsession's newest CHA release! Be sure to keep an eye on the IO Blog for the details - as always, you'll have a chance to win new stamps by commenting on our designers' blogs. 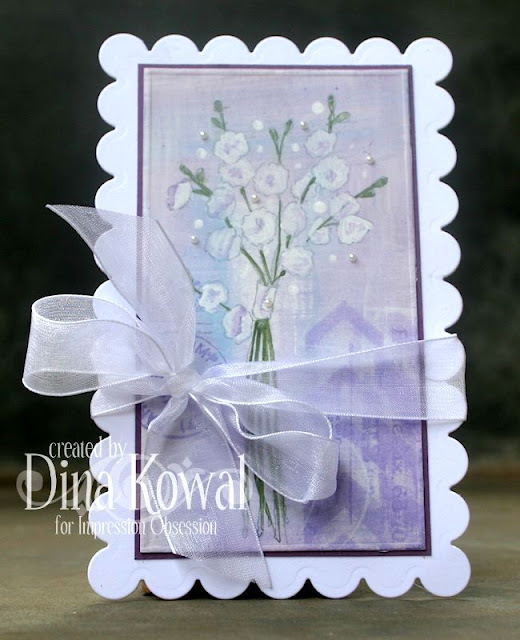 This is a stamp by Alesa Baker from the recent Valentine release at IO, called Frilly Forget Me Not - I painted the panel with acrylic paints and added some extra stamping and stenciling using chalk inks. I love this soft mixed-media look! WOW, wow and more wow. This is totally awesome!! Love the mixed media effect. U go girl. Forget-me-nots are my favorite. How clever of you to reverse the blue flower color and the white background color. Very eye-catching. Once again, thanks for the inspiration. Just beautiful. Thanks a bunch.